The Pearl Diver is a magical tale told about a young female, who dives for pearls, and a Sea Dragon. It dramatizes a Japanese legend told in many variations and forms. It appears in Japanese Kabuki dance, in a medieval Noh play, and was visually rendered in Japanese illustrated scrolls. 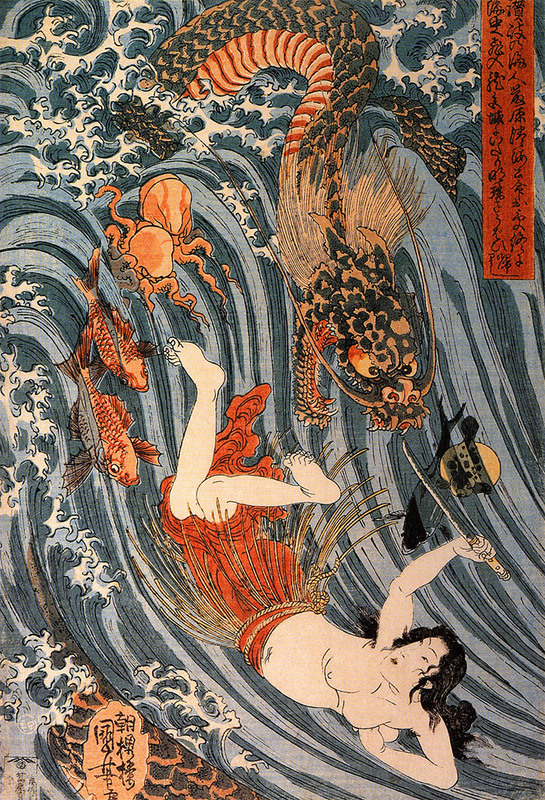 The play opens with the sinking by a Sea Dragon of a ship bringing a special pearl from China to Japan and the Dragon seizing the treasure. In the next scene a young man comes to a small fishing village and meets a beautiful young pearl diver who earns a living for herself and her Mother by diving for pearls. They begin a relationship and after she gives birth to his child she learns that he is the heir of the head of a very powerful clan in Japan. His Father has died, and the Emperor of China sent an extraordinary pearl to Japan as a gift to honor him. The Emperor of China is married to the young man's sister, the daughter of the man who died. The young man's dead Father cannot rest because the pearl, sent to honor him, has been lost. The Pearl Diver offers to go down to the Sea Dragon's cave and retrieve the pearl, which she does, cleverly outwitting the Sea Dragon and putting him to sleep with a lullaby that she had often sung to her son. When she tries to escape, the Sea Dragon awakens and he and his sea guardians (octopi, sharks, sea urchins) pursue her, making her hide the pearl in a wound in her chest. She is able to give the pearl to her lover but dies. However, the Emperor of Japan recognizes her great sacrifice and honors her by assuring that all of the future Empresses of Japan will come from her line.